Private Bass Guitar tutoring lessons Casselberry, FL. Learning to play the bass guitar is exciting since the bass is part of the rhythm section in a band. Learn to read bass clef music, chord charts and tablature. The student will learn to play songs as their ability progresses along with technic studies. I teach basic to advanced finger picking, slap, two-handed tapping, and harmonics. I am proficient at, and enjoy teaching, all musical genres ranging from jazz to rock to Latin/world music. s of music as opposed to just "picking and grinning", IE learning only "By Ear." I do specialize in music theory, and have many students taking lessons simply for this excellent foundation for songwriting also. I am a classically trained guitarist that performs both as a soloist and for ensemble in a wide variety of styles. I graduated in 1996 from Schoolcraft College with an Associates degree in Music performance, and then, studying under the tutelage of Brian Roberts went on to receive my Bachelor's degree in Guitar Performance with a secondary in Jazz from Wayne State University in 2004. While at Wayne State and along the way I've performed and participated in several masterclasses with renowned artists: William Kanengiser, John Holmquest, Philip Candelaria, Jason Vieaux, Scott Tennant, and Antigoni Goni. I have also completed the teacher requirements for books 1-a and 1-b for the Suzuki Guitar Institute. Many of my classical guitar and electric guitar students have went on to study further at the collegiate level, some achieving scholarships. My most recent students are current Berklee school of music graduates now in a band called "Flight of Fire", recently opened for Bonjovi this past summer and are getting air time on local radio stations... well on their way to living the dream! â¦the bulk of my students become full time professional musicians. I am an extremely patient person who has been teaching for over 20 years. I am laid back so there will be no pressure. With my electric and steel string guitar students, I host a special "Jam Session" 2 - 3 times a year to which will be one of your goals to participate in. This includes playing with a drummer, bassist, singer and another guitar player (usually me) and having it recorded. This should serve as your motivation to practice. This really eliminates the need for me to pull out a "yardstick" and "smack" your hands over the knuckles when not practicing your scales as many old traditional teachers may have done! At your first lesson I will talk with you and give you examples of music that is played with a Flat-Pick, or music that uses the Finger-Style technique. This will be an important process as it will dictate which direction you will go in as a musician and especially during our lessons. For the most part, playing with a Flat-Pick is generally used with the electric guitar and with most mainstream styles of music like "Rock and Roll", "Blues", "Rock-a-Billy" "Funk", and playing with the Finger-Style technique is used in styles like "Classical" and "Folk." After a while, I will introduce you to the other style of playing as well, as most great guitar players use both techniques in their playing...musicians (guitarists) such as: âJimmy Pageâ, âBrian Setzerâ, âStevie Ray Vaughanâ, âJoe Satrianiâ, âLindsey Buckinghamâ, âPaul McCartneyâ, âJohn Mayerâ, and many, many more. To make learning the guitar Fun, I make sure to incorporate your main interest(s) first. 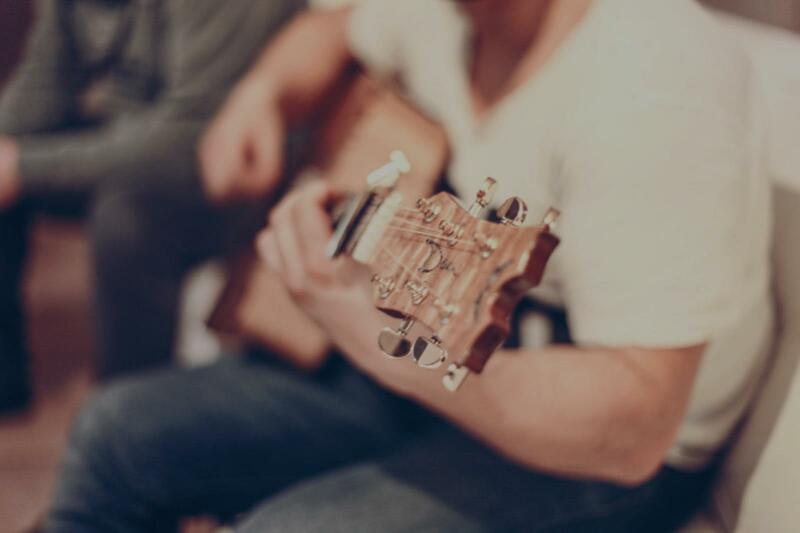 Whether it be learning your new favorite song(s), learning how to write a song, or just learning some basics that you can use for when sitting around the campfire. This will be intertwined with which style you choose to start with: Flat-Pick or Finger-Style. Pending on the level that you are starting at, (beginner, intermediate, advanced) I will include tidbits of music theory that will be used in a consistent manner. These will usually be progressive, pending on your level. For example, the songs you learn will be written out in an easy to understand chart that will have the fundamental aspects of theory (IE, chords, key, and rhythm pattern) that all musicians should understand. With Children learning with a Flat-Pick, I encourage the use of a basic guitar instruction book. "Hal Leonard Guitar Method Book One" by Will Schmid. "Alfred's Basic Guitar Method" by Alfred's Publishing Co.
"Hal Leonard Guitar Method Book Two"
With Adults, I will ask if learning to read music interests you. It is a vital part of a practicing musician, but sometimes your needs may require a more one dimensional approach as time may be of essence. Again, I learned by ear and educated myself later...so I understand the person who wants to hold off on reading right away. Students who want to learn the Classical (Finger-Style) approach will be encouraged to purchase a beginners book that I use written by one of my first instructors/mentor. It is a very intuitive book that covers the technique in great detail yet is very easy to understand (along with my help.) I will provide means of acquiring this book at your first lesson. Students who want to learn the Folk (Finger-Style) approach will usually start in the above book, unless your an adult who just wants to learn some basics. At your first lesson I will also provide you with documentation that goes more in depth about the various styles of guitar as the above info is scaled down. -Basement with plenty of seating for parents, and or observers. I specialize in Classical Guitar, Electric Guitar, and Acoustic Guitar; Improvisation, Songwriting, Backup Vocals, Fretboard Harmony, Music Theory, Performance, and Recording. I only got to take lessons from Marc for a couple of months in the summer of 2016 (I had to move away for work), but he is hands down the best music teacher I've ever encountered. It's a year and a half later and I'm still benefitting from his tutelage. From beginner to advanced, you've found the right guy for the job. Marc is a great classical guitar teacher. He makes learning fun and easy. I highly recommend him. Bass is quite easy to learn. I've been playing electric bass guitar for about 10 years now. Similar to guitar, I can teach either finger-style or with a pick. I'm a self taught guitarist who has been playing for nearly 20 years. I have played professionally in numerous bands and ensembles ranging from jazz to folk to rock, and I've been writing music for the same length of time. I currently perform with one of my students from TakeLessons named Mackenzie O'Brien. I graduated from Columbia College Chicago in May 2014 with a BA in Music Composition. I studied under composers: Drew Baker, Kenn Kumpf, Ilya Levinson, and Marcos Balter. I've performed and worked with members from the groups, Del Niente and Chicago's Composer's Collective. ore difficult. I go at the pace you learn best at! Bass guitar, ukulele, song-writing, counterpoint, orchestrating, arranging, music theory, and composing are subjects I'm well versed in and love to teach to other people. I'm experienced with all kinds of music software, such as: Pro Tools, Logic, Garage Band, Cubase, FL Studio, Finale, Sibelius. If you want to learn how to write, record, mix, and master your own music, there's never been a better time to learn. Jeremie is a great instructor. He moves and a good pace, really knows the details of what he is teaching, and caters the lesson material to you to keep it interesting. Would highly recommend! Jeremie is knowledgeable and easy to work with. He caters the lesson to your goals and I have no doubt I will achieve what I want if I stick with it! Would definitely recommend! I have taught in various music schools and have learnt and taught many different curriculums and styles over the years. This has helped me create lesson plans taking the different teaching methods and combining them with my own knowledge and playing abilities. Hey. I've been playing for over 15 years. I studied classical guitar, rock, and jazz. And have played many styles over the years. I graduated from Berklee College of Music. I have been teaching for many years, and many of my students are playing professionally. I believe that hands on knowledge of the instrument is essential. Learning and understanding music through your instrument first and then through music theory is important. No matter what level you're at and no matter what goals you have I believe lessons should be fun, engaging, and meaningful. Every students is different, so my lessons are geared towards the students goals and skill level. I achieve this with a healthy dose of attention to creativity, technique, and functionality. Lets have some fun reaching our goals! Hi fellow bass players and music lovers! I picked up the bass at the age of 7 and haven't looked back since. Playing music in any situation brings me joy and meaning in life but sharing my experiences through teaching is my real passion. I have played in almost every situation and genre imaginable, I have gone thru my teenage and young adult life in the schooling system, and I have been practicing music instruction for 6 years both thru private and group practice. I believe in a well balanced education consisting of creativity, technique, and fun. Let's play! he was very impressed with Jeremy saying he learned more in 45 minutes with him than in two weeks at band camp. Jeremy is calm, knowledgeable and patient and I am very happy with my decision to encourage my son with his guitar playing. Thanks Jeremy - very pleased we found you!" Orlando, FL teacher: Jeremy A.
someone new to push him to the next level. Not only is Damien perfecting Joshua's skills, but is introducing Joshua to music composition. I absolutely LOVE THAT!!! Thank you Damien because every time we visit, Joshua leaves with something new! FABULOUS INSTRUCTOR!!!" "I got a lot more out of the lesson than I anticipated. Great teacher. Looking forward to becoming a better bass player with his knowledge and expertise."